Regulation of T helper cell responses. Cytokines are major inducers of Th1 and Th2 subset development. Antigen-presenting cells (APCs) or a specific APC subset (e.g. distinct dendritic cell subsets), in part as a result of the cytokines that they produce, can induce the development of Th1 or Th2 cells. Naive CD4+ T cells can develop into Th1 cells responsible for cell-mediated immunity in response to interleukin 12 (IL-12). Th1 development is dependent on IFN- , and maintenance of phenotype depends on stimulation in the presence of IL-12 and IL-18. Development of Th1 responses can be antagonized directly by IL-4 and indirectly by IL-10, which inhibits the production of inflammatory mediators such as IL-12 and IL-18 from macrophages and/or dendritic cells stimulated by the innate immune response. Th2 cells, dependent on IL-4 to differentiate, have been implicated in allergic and atopic manifestations, and in addition, through their production of IL-4 and IL-10, have been suggested to play a role in tolerance: specifically, it has been suggested that a Th1-to-Th2 switch might prevent the development of organ-specific autoimmune pathologies. In the past year, it has become clear that distinct subsets of regulatory T cells are responsible for regulating both Th1 and Th2 responses and preventing the development of immune pathologies. A common feature of many of these regulatory T cells is that their function is at least in part due to the action of transforming growth factor beta (TGF- ); this would be in keeping with the ability of TGF- to inhibit both Th1 and Th2 development. Abbreviations: DC, dendritic cell; Mf, macrophage; TNF, tumour necrosis factor. Differentiation. Trends Cell Biol. 2000 Dec;10(12):542-50. As was mentioned earlier, differentiation of naive CD4+ T lymphocytes into effector T helper cells is initiated by engagement of their T cell receptor (TCR; the receptor for antigen expressed on T lymphocyte surface) (signal 1) and costimulatory molecules (signal 2) expressed on antigen presenting cells (APC) in the presence of specific cytokines produced by the innate immune system upon encounter of particular pathogens. Cytokine IFN- and IL-12 (produce by APC) initiate the differentiation of Th1 cells that are characterized by high production of IFN- and TNF- and are indispensable for clearing intracellular pathogens. In contrast, IL-4 (produce by APC) triggers the differentiation of Th2 cells. Th2 cells are key in organizing host defense against extracellular pathogens and in helping B cells to produce antibodies. The initial source of the differentiation factors for both Th1 and Th2 cells are cells of the innate immune system responding to microbial antigens, parasitic antigens, or allergens. However, the effector cytokines that are subsequently produced by Th1 and Th2 cells (i.e., IFN- and IL-4) can potentially feed back to amplify Th 1 and Th2 cells and further enhance differentiation of the respective T cell subset. Moreover, IFN- and IL-4 antagonize each other on different levels, and thus Th1 and Th2 development is considered mutually exclusive. Over the years, this Th1/Th2 paradigm of T helper cell differentiation helped explain many phenomena in adaptive immunity. Recently, the Th1/Th2 paradigm has been expanded, following the discovery of a third subset of effector Th cells that produce IL-17. This new-discovered T helper cells subset was designed as Th17 cells. Upon activation, the Th17 cells exhibit effector functions distinct from Th1 and Th2 cells. 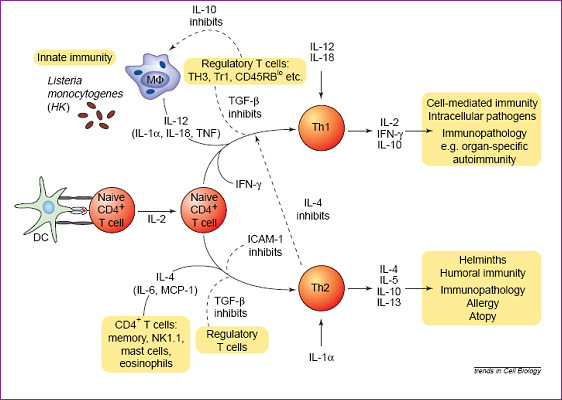 Th17 cells produce cytokines IL-17 (also called IL-17A), IL-17F, IL-22 as well as IL-21 which are different from those produced by Th1 and Th2 cells (Fig. 2). The primary function of Th17 cells appears to be the clearance of pathogens that are not adequately handled by Th1 or Th2 cells. The cytokines produced by Th17 cells allow Th17 cells to communicate with a wide variety of immune and nonimmune cells. The IL-21 (which is produced by Th17 cells) acts on other immune cells such as B cells and feeds back to further amplify Th17 responses. Other cytokines produced by Th17 cells, including IL-17, IL-17F, and IL-22, have broad effects on many cell types and induce the production of proinflammatory cytokines and chemokines to attract neutrophils to the site of inflammation and antimicrobial peptides to strengthen host defense directly. However, up to now, the precise functional mechanism of Th17 cells, in vivo, is still mysterious.